Route 1 North from Boston is congested, tacky and, at times, terrifying. It runs up , close to the coast, through Chelsea and Saugus until it breaks west a bit to run alongside U.S. 95. The real estate along the road is stuffed to the gills with American commerce: a miniature golf course with a giant dinosaur, an Italian restaurant complete with 1/4 scale leaning tower of Pisa, and a steakhouse with an enormous, glowing cactus. 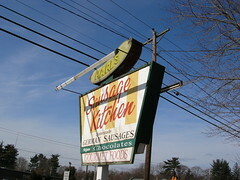 On the right side, as you drive north and reach the end of the stretch of Route 1 that cuts through Saugus is Karl’s Sausage Kitchen, marked with a sign that looks straight out of 1962. Karl’s is part German butcher, part specialty grocery. It’s the place to go if you are looking for any variety of Haribo gummy candy. They also have about 15 kinds of mustard. But the heart of Karl’s is the butcher shop. They make their own sausages, smoke their own bacon and pork chops, and carry several types of imported deli specialties (like ham, cured sausages, liverwursts, and cheese). My German neighbors tell me that Karl’s doesn’t really specialize in any one region of Germany, but offers up a kind of greatest hits of German charcuterie. When you go, you must get the bacon. It is amazing. 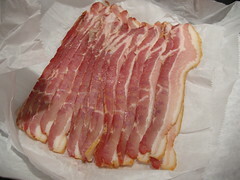 You will never be able to eat grocery store bacon again, so you should buy at least 2 — 3 lbs (that’s as much as I can order without feeling totally embarrassed; otherwise, I would order more). You’ll freeze it and it will be gone before you know it. I also enjoy the house-made bologna — it’s meaty deliciousness without the greasy, gross feeling of the bologna of my youth. As for sausages, I love the fine bratwursts (made with — gulp — veal). Also excellent are the coarse bratwursts (these are a traditional mix of beef and pork) and the plump, red knockwursts. All of these work great in the following recipe, which is an excellent way to enjoy your Karl’s bounty. Heat the butter in a 12” skillet with a tight fitting lid over medium-high heat. When the foam subsides, add the wursts, and reduce heat to medium. Brown the wursts, turning after about 1 minute. Remove to a plate. Add the sliced onion, grated carrot, juniper berries and about ½ teaspoon salt to the skillet. Cook, stirring frequently, until the onions are soft and begin to brown. Add the drained sauerkraut, grated apple, brown sugar and chicken broth to the pan, along with another ¼ to ½ teaspoon salt (depending on the saltiness of your broth). Increase heat to medium-high and bring the mixture to a simmer. 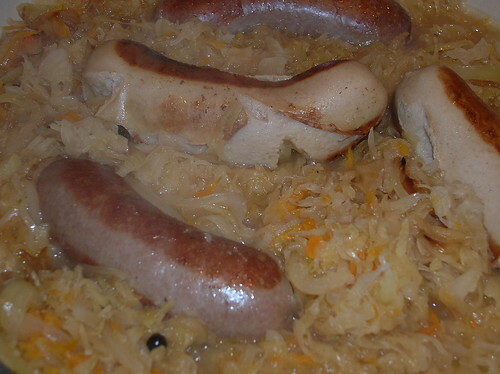 Return the wursts to the pan and nestle them in the sauerkraut. Cover the pan, reduce heat to low, and simmer for 30 minutes or until almost all the broth is evaporated. Taste the sauerkraut and adjust the seasoning with salt and pepper. Serves 4 — 6. Serve with boiled potatoes or noodles and spicy mustard. *If you’re around these parts, you can buy juniper berries (along with about any other spice you can think of) at Christina’s in Inman Square, Cambridge. And after you’re done shopping, you can go next door to the ice cream parlor for a scoop of burnt sugar, khulfi, pumpkin, fig, fresh mint or Mexican chocolate ice cream. This entry was posted in apple, dinner, pork, sauerkraut, sausage, sourcing. Bookmark the permalink.